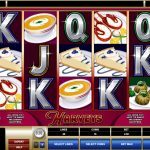 Harveys is a very tempting video slot game from Microgaming, we just hope you are not hungry while you are playing because the action takes place in the middle of a busy restaurant. Some of those symbols especially the creamy soup can be mouth watering. And not to forget Harvey, he is not only going to bring the most exquisite French cuisine to you but also it will fill in every time you miss a symbol to complete a winning line. The design of the game might be a bit outdated but this game compensate on other levels so this can go unnoticed. 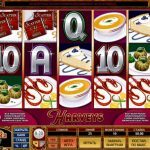 Harveys slot is packed with special symbols and features. First of all we have Harvey, who acts as a wild and substitute for every other symbol in order to complete a winning line, except for the scatter and bonus symbol. Then, we have another special symbol, the scatter which offers only scatter pay outs in this game. And last but not least we have the champagne symbol which is the key to the main feature, the free spins. This symbol appears on the second and the fourth reel and once you land them simultaneously you can win up to 30 free spins with x 25 multiplier. 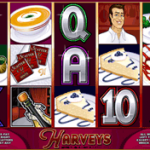 Harveys is a video slot game that turns out to be quite the refreshing, maybe that was Microgaming`s idea in the first place. The game offers everything a player wants, entertaining and straightforward game with special features that can bring some lucrative wins. The betting options allow every kind of a player to find their right betting size and enjoy playing as long as they want. So no matter if you are low roller or high roller you will love this game. If you like the thrill and speed of Formula 1 then consider playing Good To Go a 5 reel slot by MicroGaming.